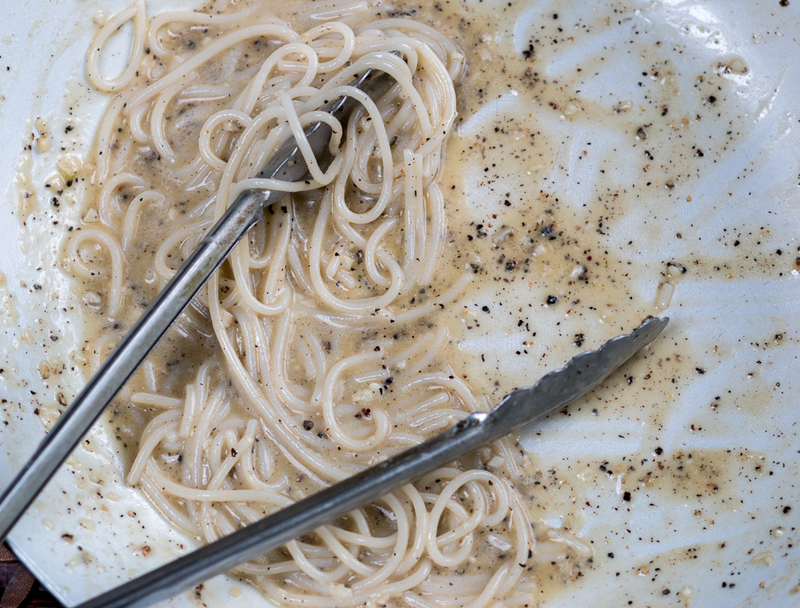 Cacio e Pepe is a quick and tasty Roman Pasta Dish with a creamy, stirred peppery sauce ~ which is getting a little makeover. I’ve added roasted zucchini and chopped garlic to the traditional recipe ~ delicious! 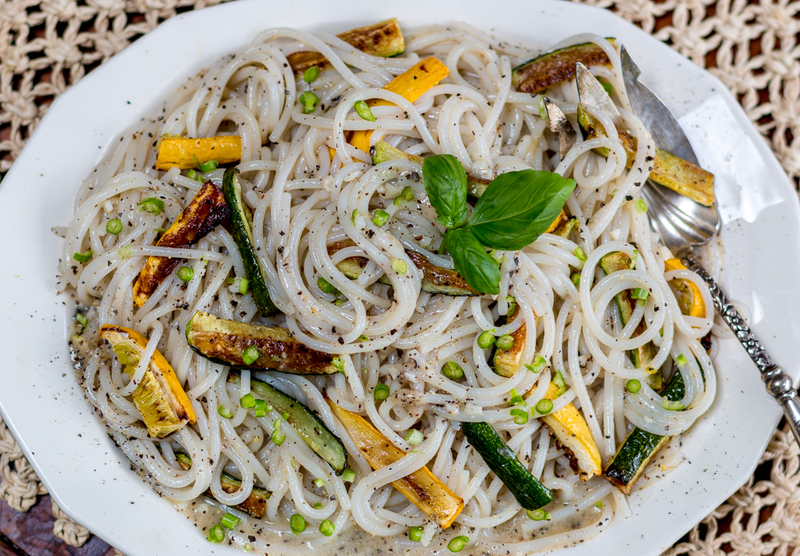 This gluten-free spaghetti is the best I’ve tried… use traditional pasta too. I’ve changed up the classic recipe (yes, I dare to do so!) to add a healthier profile with lots of oven roasted zucchini and chopped garlic. This is a great technique to get your required daily vegetables – and it tastes great… totally complements the pasta. Add the zucchini, 1 t. oil, salt & pepper to a rimmed sheet pan. Mix all together to coat evenly. Roast in the oven for 20 minutes, tossing the zucchini once until golden on the outside and caramelized. Set aside. In a heavy, wide skillet, heat 3 T. olive oil and pepper over very low heat for one minute. Add the garlic, stir and cook for just two minutes, yet do not color the garlic. Add 1 1 /2 cups of the pasta water (not yet the full 2 cups) to the pan, bring to a boil. Quickly add the pasta, turn heat down to a simmer – and stir for one minute. Remove from heat, add the 2 cheeses and stir briskly until a creamy sauce is formed. Add the remaining 1/2 cup of water, tablespoon at a time to achieve a creamy sauce, if needed. Toss the zucchini into the pasta, mix well and add to a platter or individual bowls. Best made and eaten at once. If reheating – save some pasta water, add at little to achieve a creamy sauce.